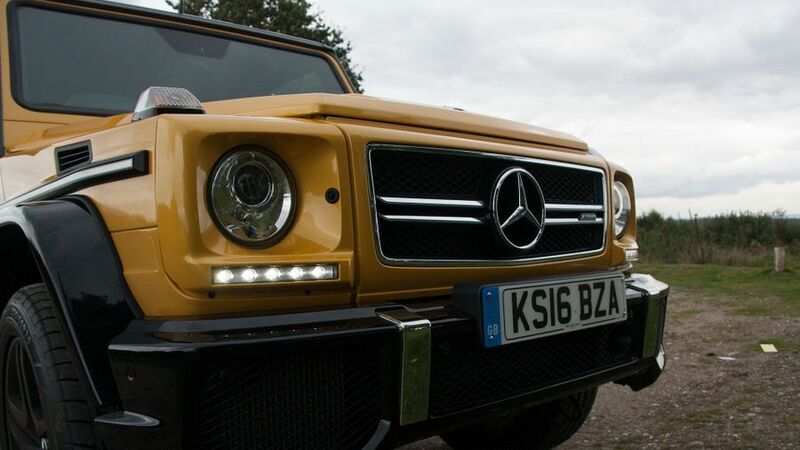 There’s not much like the Mercedes-Benz G-Class on the road. This is a car that will be noticed, because it has huge (literally) presence. Primarily built for off-roading, and used by plenty of armies around the world, it’s now found favour as a ‘luxury’ SUV that packs a serious punch. You’re just as likely to see it in Chelsea, as you are in Chechnya. Not much will stop you off-road, but it’s not exactly a dream to drive on-road, with its sheer size, uncomfortable ride, and slow steering. It’s certainly not anywhere near as luxurious or as comfortable as a Range Rover or a Bentley Bentayga, but it’s got a certain charm. Interested in buying a Mercedes-Benz G Class? 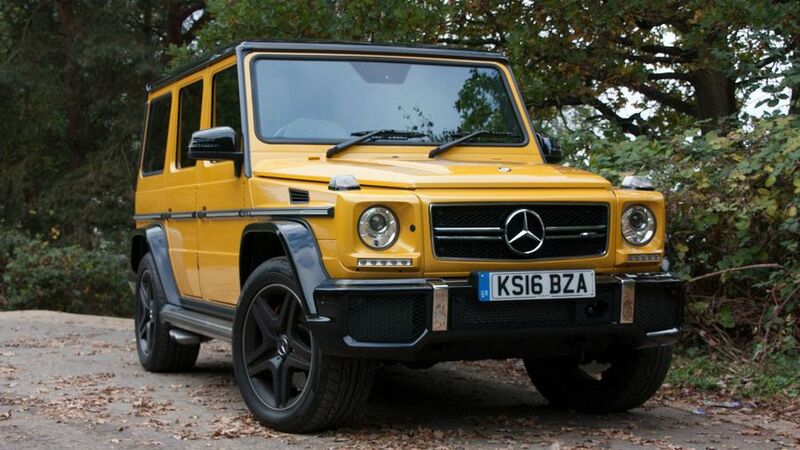 The Mercedes G-Class is not for wallflowers… it’s big, brash, and boxy. It’s also largely unchanged from the original design of the 1979 model. This car has presence, and will always get you noticed wherever you go. The ‘standard’ G350d comes with 19-inch alloy wheels, LED daytime running lights, metallic paint, privacy glass, a tow bar, and of course, the spare wheel cover with the Mercedes-Benz star on it. 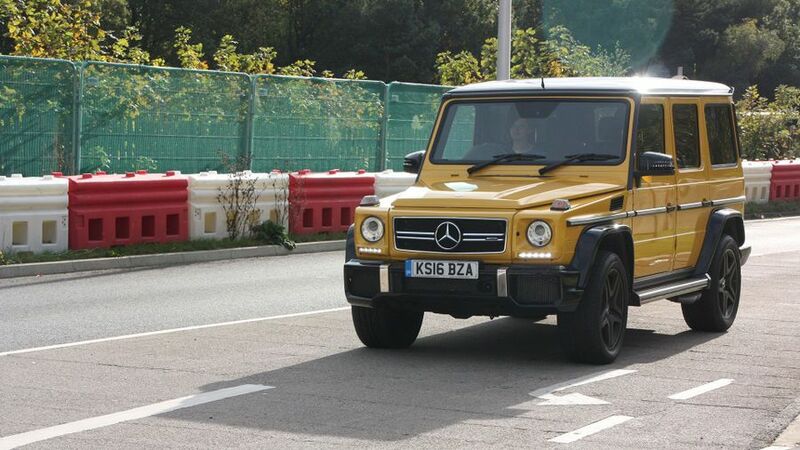 If you really want to be noticed, there’s also the bonkers AMG G63, which comes with an AMG two-bar grille with chrome trim, wheel arch extensions, bigger 20-inch alloys, V8 Biturbo badges, red brake calipers, and an AMG exhaust. 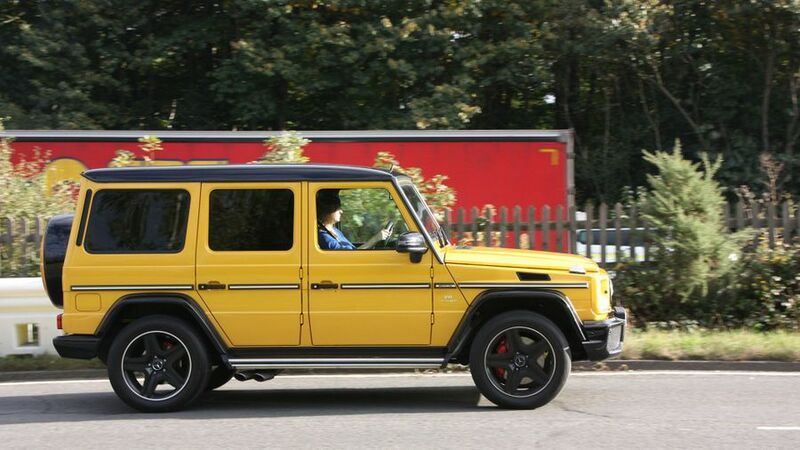 Or you can get the AMG version in the ‘Colour Edition’, if you just need your G-Class to stand out more… pick from Tomato Red, Alien Green, Galactic Beam, Solar Beam or Sunset Beam paint colours. Although the G-Class’ interior has been updated since the late 70s, it still retains a few nods to the past, including the grab handle on the front passenger side, switches for the three differential locks (which will help in slippery conditions) and the gearshift lever. There’s lots of leather to make things feel a bit more luxurious, and everything feels very solidly screwed together. It’s got most of the bits and bobs that you’d find in other Mercedes-Benz cars, and some new technology. However, the layout is rather old-school, with lots of buttons strewn about the place which makes it hard to find the one you want first time. The 8.0-inch infotainment system is fine to use once you’ve got your head around it, but it runs an older version of Mercedes’ system, so the graphics and usability are a bit off-the-pace. The seats are very upright indeed, but still comfortable. Front visibility is good, as you’re so high up, you can easily see where the bonnet ends to place the car. The window pillars are slim front and rear to aid visibility, but thanks to the spare wheel on the back, rear view is still limited. 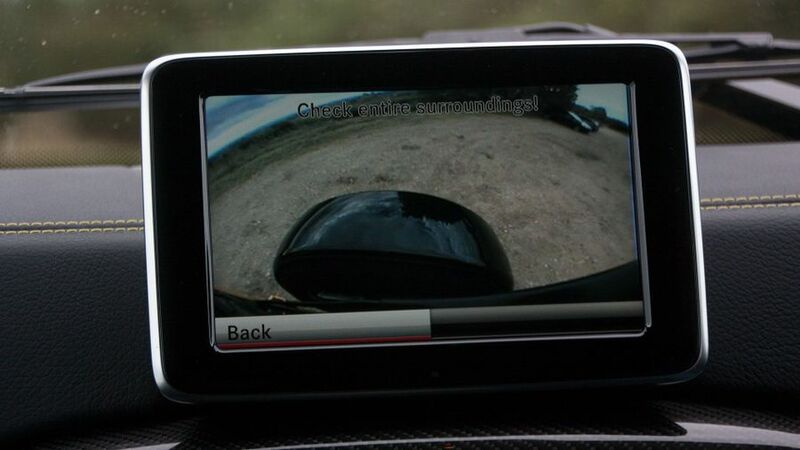 The reversing camera helps, but hey, you’re in a G-Wag, everything will move out of your way. Despite the size of the G-Class, the interior space is ok rather than exceptional. Everyone gets plenty of headroom, and the driver and front-seat passenger get a decent amount of legroom, but it’s a bit cosier in the back. Three adults will be a squeeze on the back seats. The glove box is small, and there’s not much other storage around the cabin for bits and bobs. The lack of storage space in the cabin is made up for in boot size though: 699 litres with the seats up, and 2250 litres with the seats down. That’s bigger than the Range Rover and Bentayga. 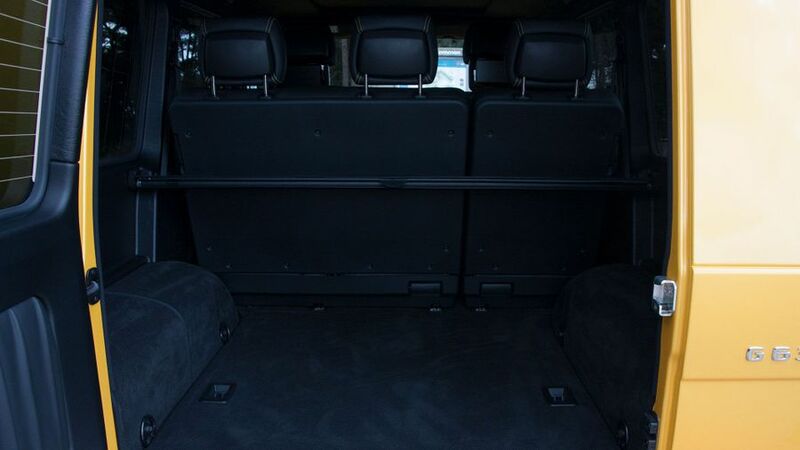 There are lots of load securing points around the cavernous boot so your stuff won’t fly around, and there’s optional nets and covers available. The boot opens with a side-hinged door rather than a conventional vertical tailgate, which can cause you problems if you park close to a wall or other car. Off road, there’s really not much the G-Class can’t cope with. After all, the ‘G’ stands for Geländewagen, which means cross-country vehicle, so it’s happy on rocks, sand, mud or fields. On the road, however, things aren’t quite so rosy. The G-Class really does feel as big as it looks. In bends you feel like it might tip over, and you need a lot of turns on the steering wheel to get it round a tight corner. You’ll feel like you’ve had a bit of a workout after driving it. The steering also takes ages to self-centre, and there’s a large dead spot around the straight-ahead position, so you can do some comedy 1950s Hollywood driving and stay in a straight line. The ride is stiff and very bouncy, meaning it's not all that comfortable in any sort of driving situation. However, on the motorway, or in a straight line, there’s not much wind noise, and it’s quite happy to plod along. There are two models in the G-Class line-up. The ‘base’ model is the G350 diesel, which has a 3.0-litre V6 with 245 horsepower, and comes with a seven-speed automatic gearbox. The engine has plenty of power, although if you put your foot down from standstill there’s a rather pronounced delay, which will make pulling into traffic tricky. It can do the 0-62mph run in 8.8 seconds, which is not bad for a car that weighs more than two tonnes. The engine is grumbly, and can be loud when accelerating, but the gearbox never struggles finding the right gear. Then there’s the absolutely nuts AMG G63 version, with a 5.5-litre twin-turbo V8 petrol engine with 570 horsepower and a 0-62mph time of 5.4 seconds. When you put your foot down, you - and everyone within a mile radius of you - will know you've put your foot down. However, the power and pace it gives isn't an entirely pleasurable experience, because it's too much for the rest of the car to handle. This is not a car you want to be throwing into corners at high speed. After the initial outlay for the car, which is of course not cheap (and if you go for the AMG model, it's really really not cheap), you’ll be looking at a few other pretty steep costs. The G350 has an official fuel economy figure of around 28mpg, with the AMG model officially at just over 20mpg, so that’s going to be a lot of juice required. Insurance costs will be steep, and your road tax will be thousands rather than hundreds. The G-Class does have better residual values than the Bentley Bentaya, though, and similar service, maintenance and repair costs to the Range Rover. There’s no specific reliability data available on the G-Class, but Mercedes as a brand sits in the lower half of the Warranty Direct manufacturer rankings. 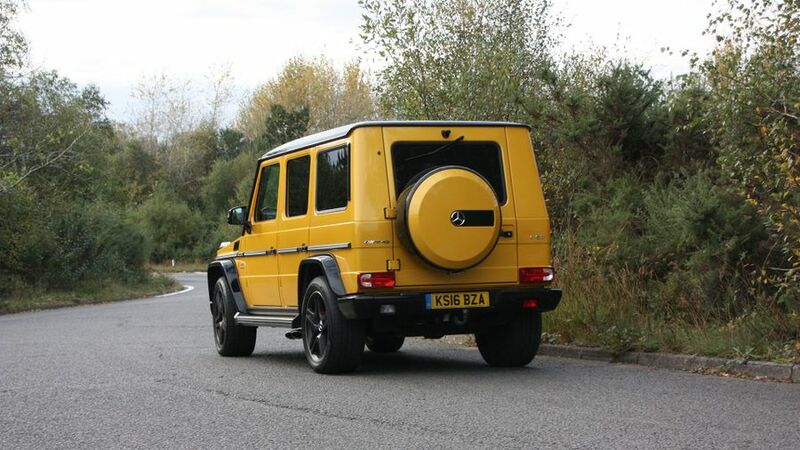 However, owner reviews on our site paint a very happy picture of the G-Class, praising its quality, its ability to get any job done, and some owners even reporting never needing to get it repaired in years of ownership. The G-Class comes with a three-year/unlimited mileage warranty, up to 30 years warranty against corrosion from the inside-out, and Roadside Assistance, which covers you for 30 years of breakdowns anywhere in Europe. 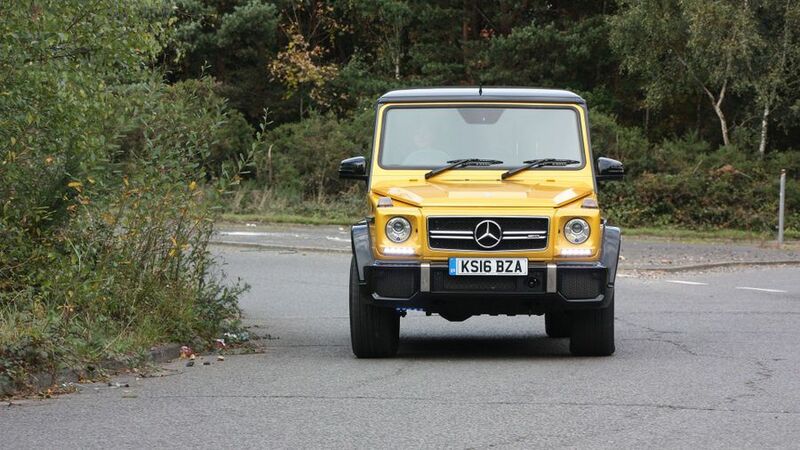 The G-Class hasn’t been tested by safety organisation Euro NCAP, but Mercedes vehicles are generally very safe. You do also get a good amount of standard safety kit, including electronic stability control, multiple airbags, whiplash-reducing front head restraints and a system which boosts the braking force if you brake quickly. However, the latest clever systems - like automatic emergency braking - are absent from the list of safety goodies. Adaptive cruise control and a blind spot warning system are available as an optional driving assistance package. You do get a generous amount of standard equipment. This is a car that is being aimed at the luxury end of the market. 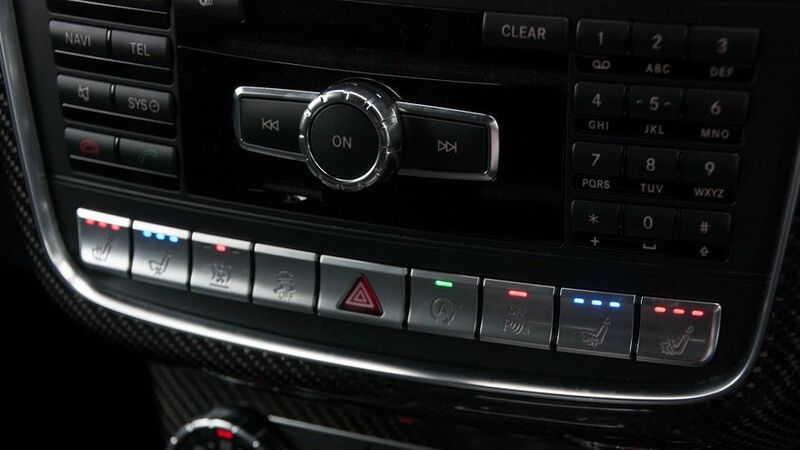 The G350d only has one trim level, and comes with a reversing camera, heated seats front and back, a heated steering wheel, leather upholstery, automatic climate control, and a Harmon Kardon sound-system. You get an 8.0-inch colour display which you control with a dial. This comes with Bluetooth, DAB, Apple CarPlay and Android Auto, sat-nav, Mercedes online services, an emergency call system and a CD/DVD player. The AMG model gets you some extra exterior and interior styling bits, along with some performance updates, a sunroof and an AMG performance steering wheel. Either because you need a car that will cope with anything you throw at it when it comes to off-roading, you want the build quality of a Mercedes, and you have a lot of money. Or, because you want to be seen on the road, have your presence felt wherever you go, love the boxy retro styling, and you’ve got a lot of money.